This Mandatory Declassification Review contains material from the files of Robert Boorstin, NSC Speechwriter. 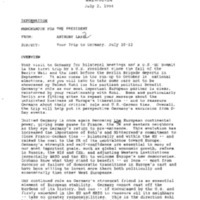 Material includes a memo from National Security Advisor Anthony Lake to President Clinton regarding an 1994 trip to Germany. Also included are Department of State reports and papers on a variety of international topics.